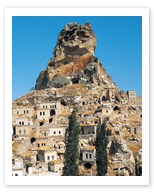 Uchisar is a terrific spot from which to get gorgeous, undisturbed views of the Cappadocian landscape. This quiet little town, set up in the shadow of a huge rock tower and a Medieval fortress, today has a quiet village feel. You will find it a very pleasing place from which to explore the enchanting countryside.